Effective May 4, 2017, the New York State Department of Conservation has issued a temporary ban on the harvesting of shellfish and carnivorous gastropods in western Shinnecock Bay and the harvesting of carnivorous gastropods in Deep Hole Creek, Halls Creek and a section of Great Peconic Bay in the Town of Southold is also temporarily banned. The area around Deep Hole and Halls creeks is already closed to shellfishing, but not to the harvesting of gastropods between May 1 and Nov. 30 on a seasonal basis. Town of Southampton: All that area of western Shinnecock Bay lying west of a line extending southerly from the southernmost point of land at Pine Neck Point in East Quogue to the northern terminus of Triton Lane, on the barrier beach, and easterly of the northbound lane of the Post Lane Bridge in Quogue. Town of Southold: All of Deep Hole Creek and Halls Creek (between Mattituck and Cutchogue) and all that area of Great Peconic Bay within 500 yards in all directions of the northernmost tip of Marratooka Point. The Shinnecock Bay emergency closure. 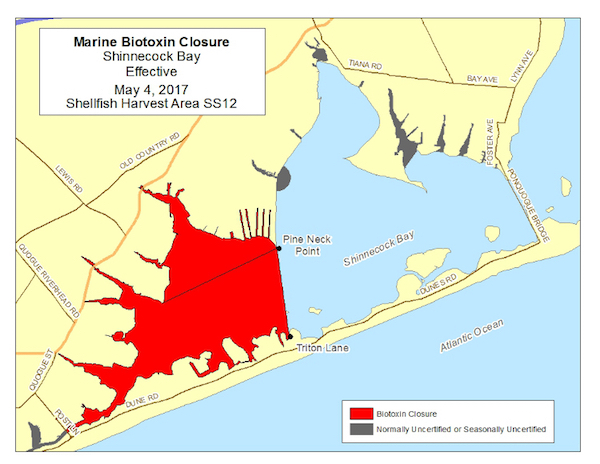 According to the Long Island Coastal Conservation Research Alliance, the DEC has found levels of the biotoxin saxitoxin exceeding US federal standards in shellfish in these areas. Saxitoxin is made by the dinoflagellate Alexandrium, which forms red tide blooms globally and on Long Island. Filter-feeding shellfish (clams, oysters, mussels and scallops) can accumulate Alexandrium and saxitoxin. Saxitoxin is a neurotoxin that causes paralytic shellfish poisoning in humans who consume contaminated shellfish, a syndrome also known as paralytic shellfish poisoning. A recent study published in the journal Toxicon by Stony Brook University researchers demonstrated that a similar bloom in the Peconic Estuary in 2015 was responsible for the death of hundreds of diamondback terrapin turtles. Saxitoxin is 1,000-times more biologically potent than cyanide. There have been a dozen such closures on Long Island since then 2006 but none prior to that year. Saxitoxin-containing red tides caused by Alexandrium are known to occur in poorly flushed regions of Long Island that received high levels of nitrogen loading from land. The event in Shinnecock Bay marks the fourth shellfish bed closure in seven years in that system, while the closure in Peconic Bay marks the second in three years. For the most up to date temporary emergency closure information, call the DEC’s hotline at 631.444.0480. For any other questions, call the main shellfish office at 631.444.0492, Monday through Friday 8:30 a.m. to 4:45 p.m.